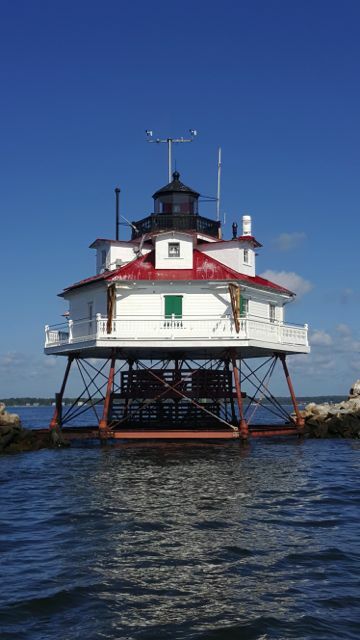 Workday: Thomas Point Lighthouse – September 4 & 7, 2015 – Chesapeake Chapter U.S.L.H.S. 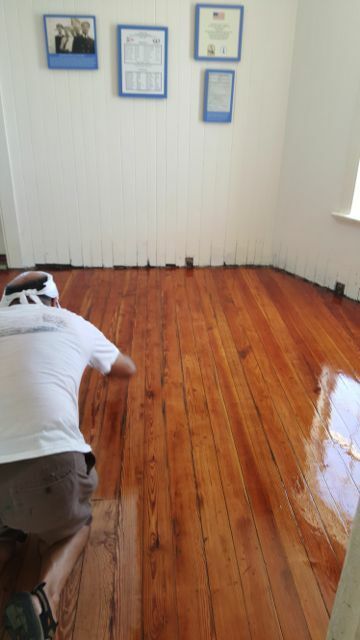 Henry applies varnish to the recently sanded floor. What did you do for Labor Day? 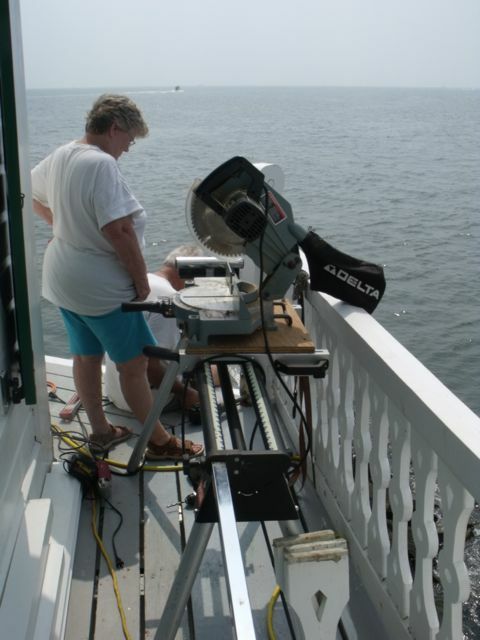 Well some of our volunteers labored on Thomas Point over the long weekend. On September 4th, five volunteers worked on a day more reminiscent of the heat and humidity of mid-August. They spent some time removing the old railings from one section of the light. Then they painted some of the support beams adding some flashing on top. They installed two new 12-foot pressure-treated boards that were primed on the under side and cut to fit around the posts. They also installed several new posts and some rails. While part of the crew worked on the railings, another power washed a section of the recently refinished roof. The heat/humidity kept them from completing the railing job, so they secured safety orange plastic netting to the open walkway areas. 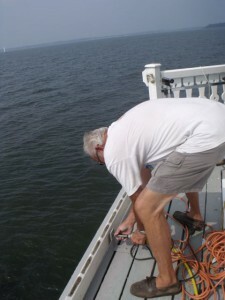 They also did a quick repair to a post that had decayed that is located on the lantern level near the flagpole. They removed some of the old lumber. 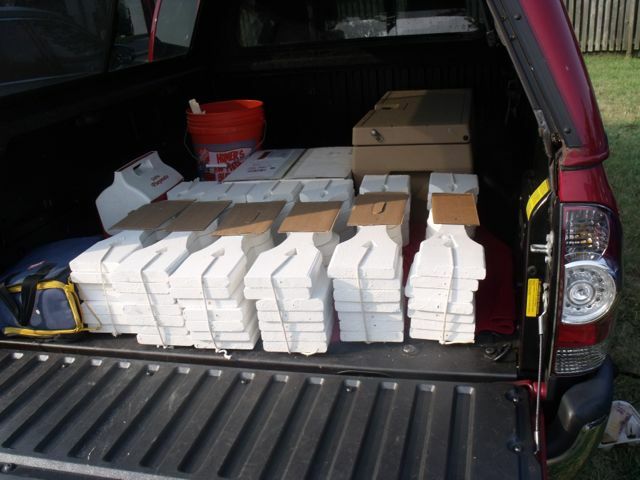 It was a full days work on a hot Labor Day weekend. 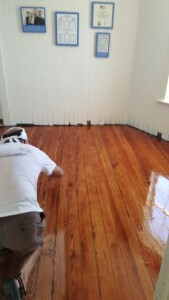 On September 7th a small crew went out and applied a coat of varnish to the recently sanded floor in the sitting room. So the floor now shines- restored to its former glory. New pickets ready to install. Howard Lewis prepares to install new pickets. Cathy and Howard Lewis install new pickets. 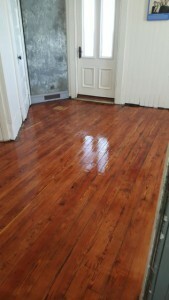 The floor shines after a coat of varnish was applied. 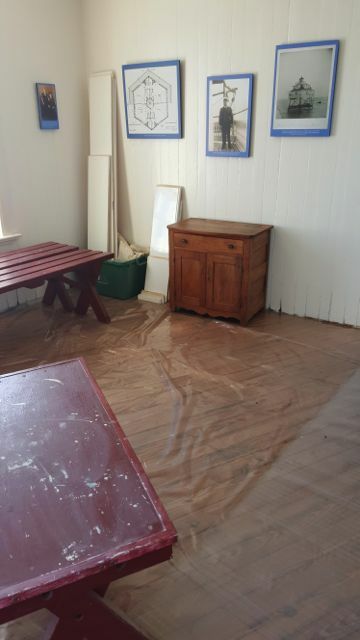 Floor covered after varnish applied. 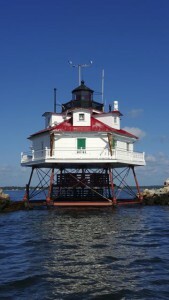 Thomas Point Lighthouse – Can you tell if the pickets are new or old?